Defects, disorders, diseases can play a paradoxical role, by bringing out latent powers, developments, evolutions, forms of life, that might never be seen, or even be imaginable, in their absence. It was the start of a new school year. Mr. Farmington, a first-year 5th grade teacher, was perusing his roster of incoming students when it hit him like a ton of bricks: In his class this year, he was going to have two students with learning disabilities, one student with ADHD, one with autism, one with Down syndrome, and one with an emotional disorder. In a class of 30 students, this ratio seemed like too much to bear. Inclusion is all well and good, thought Mr. Farmington, but he already had too much to do. Disgruntled, he took his roster and his misgivings to his principal, Ms. Silvers. "I'm not trained as a special education teacher," he told her. "Who's going to help me with all the problems I'm going to face with these kids?" Ms. Silvers listened carefully to Mr. Farmington's concerns. She understood where he was coming from. She'd heard complaints like his from teachers before and had often responded by reassigning at least some of the special education kids to other classrooms. But in this case, she decided to handle the situation a little bit differently. "Bill," she said, "I know that you're thinking about these kids as problems and believe that they're just going to make your year harder. First of all, let me assure you that you're going to get a lot of support from the special education staff. But there's something else I want you to know. What if I were to tell you that these kids have talents and abilities that are going to enhance your classroom, and that even might make your year easier and more enjoyable? One of the boys that we diagnosed as having a learning disability is totally into machines and can fix just about anything mechanical. The child with autism is absolutely obsessed with military battles, which should be an asset in your history lessons. The girl with Down syndrome was reported by her 4th grade teacher to be one of the friendliest kids she'd ever worked with in her 30 years of teaching. And the boy with an emotional disorder happens to be an artist who has exhibited his work at a local art gallery." "Wow," said Mr. Farmington. "I had no idea. I guess I was just reacting to their labels. Thanks for the heads-up." Mr. Farmington left the meeting with a new, more positive attitude about his kids with special needs and a greater willingness to give them a chance to succeed in his classroom. The above scenario may strike some as overly optimistic, but it raises an important question: Is it better to think about students with special needs as liabilities or as assets? If it's better to perceive them as assets, then why aren't we doing a better job of identifying their strengths? Google the phrase "strengths of students in special education," and you're likely to find a wide selection of websites focused on the pros and cons of inclusion and labeling, but practically nothing about the specific strengths of kids in special education. The truth is that since the beginning of special education in the early 1950s, the conversation about children with special needs has been almost exclusively a disability discourse. In one way this makes perfect sense. After all, we're talking about kids who are labeled as special education students precisely because they've had difficulties of one kind or another in the classroom. But if we truly want to help these kids succeed in school and in life, it seems to me that we need to make a comprehensive, all-out inventory of their strengths, interests, and capabilities. To do this, we need a new paradigm that isn't solely based upon deficit, disorder, and dysfunction. Fortunately, a new way of thinking about students with special needs has emerged on the horizon to help us: neurodiversity. The idea of neurodiversity is really a paradigm shift in how we think about kids in special education. Instead of regarding these students as suffering from deficit, disease, or dysfunction, neurodiversity suggests that we speak about their strengths. Neurodiversity urges us to discuss brain diversity using the same kind of discourse that we employ when we talk about biodiversity and cultural diversity. We don't pathologize a calla lily by saying that it has a "petal deficit disorder." We simply appreciate its unique beauty. We don't diagnose individuals who have skin color that is different from our own as suffering from "pigmentation dysfunction." That would be racist. Similarly, we ought not to pathologize children who have different kinds of brains and different ways of thinking and learning. Although the origins of the neurodiversity movement go back to autism activist Jim Sinclair's 1993 essay "Don't Mourn for Us," the term neurodiversity was actually coined in the late 1990s by two individuals: journalist Harvey Blume and autism advocate Judy Singer. Blume wrote in 1998, "Neurodiversity may be every bit as crucial for the human race as biodiversity is for life in general. Who can say what form of wiring will prove best at any given moment? Cybernetics and computer culture, for example, may favor a somewhat autistic cast of mind." In 1999, Singer observed, "For me, the key significance of the 'Autistic Spectrum' lies in its call for and anticipation of a politics of Neurological Diversity, or what I want to call 'Neurodiversity.' The 'Neurologically Different' represent a new addition to the familiar political categories of class/gender/race and will augment the insights of the social model of disability" (p. 64). According to a widely disseminated definition on the Internet, neurodiversity is "an idea which asserts that atypical (neurodivergent) neurological development is a normal human difference that is to be recognized and respected as any other human variation." The online Double-Tongued Dictionary characterizes neurodiversity as "the whole of human mental or psychological neurological structures or behaviors, seen as not necessarily problematic, but as alternate, acceptable forms of human biology" (2004). The term neurodiversity has gathered momentum in the autistic community and is spreading beyond it to include groups identified with other disability categories including learning disabilities, intellectual disabilities, ADD/ADHD, and mood disorders (see, for example, Antonetta, 2007; Baker, 2010; Hendrickx, 2010; and Pollock, 2009). This new term has great appeal because it reflects both the difficulties that neurodiverse people face (including the lack of toleration by so-called "normal" or "neurotypical" individuals) as well as the positive dimensions of their lives. Neurodiversity helps make sense of emerging research in neuroscience and cognitive psychology that reveals much about the positive side of individuals with disabilities. It sheds light on the work of Cambridge University researcher Simon Baron-Cohen, who has investigated how the strengths of individuals with autism relate to systems thinking in fields such as computer programming and mathematics (Baron-Cohen, 2003). It manifests itself in the work of University of Wisconsin and Boston College researchers Katya von Karolyi and Ellen Winner, who have investigated the three-dimensional gifts of people with dyslexia (Karolyi, Winner, Gray, & Sherman, 2003). It shows up in the works of best-selling author and neurologist Oliver Sacks, whose many books of essays chronicle the lives of neurodiverse individuals (a term he doesn't use, but of which I think he would approve) as they experience both the ups and downs of their atypical neurological makeup (Sacks, 1996, 1998, 2008). We should keep in mind that the term neurodiversity is not an attempt to whitewash the suffering undergone by neurodiverse people or to romanticize what many still consider to be terrible afflictions (see Kramer, 2005, for a critique of those who romanticize depression). Rather, neurodiversity seeks to acknowledge the richness and complexity of human nature and of the human brain. The concept of neurodiversity gives us a context for understanding why we are so frequently delighted with Calvin's ADHD behavior in the Calvin & Hobbes comic strip, amused by Tony Shalhoub's obsessive-compulsive detective on the TV show Monk, and inspired by Russell Crowe's performance as Nobel Prize winner John Nash (who has schizophrenia) in the movie A Brilliant Mind. The implications of neurodiversity for education are enormous. Both regular and special education educators have an opportunity to step out of the box and embrace an entirely new trend in thinking about human diversity. Rather than putting kids into separate disability categories and using outmoded tools and language to work with them, educators can use tools and language inspired by the ecology movement to differentiate learning and help kids succeed in the classroom. Until now, the metaphor most often used to describe the brain has been a computer or some other type of machine. But the human brain isn't hardware or software; it's wetware. The more we study the brain, the more we understand that it functions less like a computer and more like an ecosystem. The work of Nobel Prize–winning biologist Gerald Edelman supports this view (see, for example, Edelman, 1987, 1998). Edelman wrote, "The brain is in no sense like any kind of instruction machine, like a computer. Each individual's brain is more like a unique rainforest, teeming with growth, decay, competition, diversity, and selection" (quoted in Cornwell, 2007). In fact, the term brainforest may serve as an excellent metaphor when discussing how the brain responds to trauma by redirecting growth along alternative neurological pathways, and in explaining how genetic "flaws" may bring with them advantages as well disadvantages. Disorders such as autism, ADHD, bipolar disorder, and learning disabilities have been in the gene pool for a long time. There must be a reason why they're still there. As we'll see in the course of this book, the work of evolutionary psychologists represents a key component in exploring this fascinating question. The use of ecological metaphors suggests an approach to teaching as well. After all, regular classroom teachers are far more likely to want a "rare and beautiful flower" in their classroom than a "broken," "damaged," or "problem" child. Just as we accept that individual species of plants have specific environmental needs (e.g., sun, soil, water), we need to understand that neurodiverse children require unique ecological nutrients in order to blossom. Teachers should not seek to "cure," "fix," "repair," "remediate," or even "ameliorate" a child's "disability." In this old model, kids are either made to approximate the norm (especially for national accountability tests) or helped to cope with their differences as best they can (the cliché that students can learn to live successful and productive lives "despite" their "disabilities" comes to mind here). Instead, teachers should seek to discover students' unique requirements for optimal growth, and then implement differentiated strategies to help them bloom. In the neurodiversity model, there is no "normal" brain sitting in a vat somewhere at the Smithsonian or National Institutes of Health to which all other brains must be compared. Instead, there are a wide diversity of brains populating this world. The neurodiversity-inspired educator will have a deep respect for each child's unique brain and seek to create the best differentiated learning environment within which it can thrive. 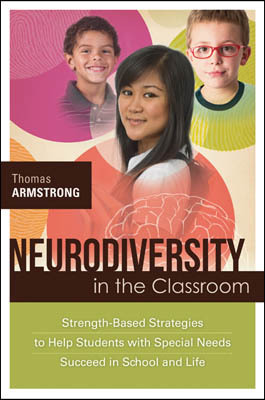 This practice of differentiating instruction for the neurodiverse brain will be referred to in the course of this book as positive niche construction. In the field of biology, the term niche construction is used to describe an emerging phenomenon in the understanding of human evolution. Since the days of Darwin, scientists have emphasized the importance of natural selection in evolution—the process whereby organisms better adapted to their environment tend to survive and produce more offspring. In natural selection, the environment represents a static entity to which a species must either adapt or fail to adapt. In niche construction, however, the species acts directly upon the environment to change it, thereby creating more favorable conditions for its survival and the passing on of its genes. Scientists now say that niche construction may be every bit as important for survival as natural selection (Lewontin, 2010; Odling-Smee, Laland, & Feldman, 2003). We see many examples of niche construction in nature: a beaver building a dam, bees creating a hive, a spider spinning a web, a bird building a nest. All of these creatures are changing their immediate environment in order to ensure their survival. Essentially, they're creating their own version of a "least restrictive environment." In this book, I present seven basic components of positive niche construction to help teachers differentiate instruction for students with special needs (see Figure 1.1). If our only knowledge about students with special needs is limited to the negatives in their lives—low test scores, low grades, negative behavior reports, and deficit-oriented diagnostic labels—then our ability to differentiate learning effectively is significantly restricted. Research suggests that teacher expectations powerfully influence student outcomes—a phenomenon that has been variously described as "the Pygmalion effect," "the Hawthorne effect," "the halo effect," and the "placebo effect" (see, for example, Rosenthal & Jacobson, 2003; Weinstein, 2004). As Paugh and Dudley-Marling (2011) note, "'deficit' constructions of learners and learning continue to dominate how students are viewed, how school environments are organized, and how assessment and instruction are implemented" (p. 819). Example of poor niche construction: Eldon has just been diagnosed as having ADHD and an emotional disorder. In the teacher's lounge, teachers trade stories about his temper tantrums and his failure to comply with school rules. He has been observed commenting to his peers, "I've just been transferred to the retarded class. I guess that means I'm a retard, too." Other students refer to him as a "loser," a "troublemaker," and a "bully." Example of positive niche construction: Ronell has ADHD and an emotional disorder. He also has been recognized as having leadership capabilities in his gang affiliations, good visual-spatial skills (he enjoys working with his hands), and an interest in hip-hop music. Teachers and students have been instructed to look for Ronell's positive behaviors during the school day and share them with him. Ronell has been informed of his profile of multiple intelligences (high interpersonal, spatial, bodily-kinesthetic, and musical intelligences) and has been observed commenting to his peers, "I guess I'm good at a few things, after all." Children are powerfully influenced by the adults they see in their daily lives. Social learning theory tells us that behavior modeling by adults provides children with one of the major building blocks they require for constructing complex behaviors in life (Bandura, 1986). Scientists suggest that this may be due to the existence of "mirror neurons"—brain cells that fire not only when we do something, but also when we observe others doing that same thing (Rizzolatti & Craighero, 2004). Adult role models are especially important for kids with special needs. Students with learning disabilities ought to learn about the lives of people who also had learning disabilities and became successful in their chosen careers, such as the novelist John Irving, the actor Whoopi Goldberg, the Nobel Prize–winning biochemist Carol Greider, and the brokerage firm CEO Charles Schwab. Students with ADHD may be heartened to learn about famous people with ADHD, including Olympic athlete Michael Phelps, actor Jim Carrey, film director Stephen Spielberg, and inventor Thomas Edison. Those with intellectual disabilities can take pride in identifying with individuals like them who have accomplished great things, including actor Chris Burke, musician Sujeet Desai, artist Jane Cameron, and college graduate Katie Apostolides. Of course, celebrities aren't the only role models. Neurodiverse adults who have become successful in their local communities should be invited to visit schools, share stories, and provide inspiration for all students, not just those with special needs. Example of poor niche construction: Susan is a sophomore in high school who has Down syndrome. She has been commenting to her peers and to her teachers that she is "just plain stupid" and that she'd like to drop out of school. One of her teachers calls her "my darling dummy," which elicits laughter from the other students. Example of positive niche construction: Shelly is a freshman in high school who has Down syndrome. Her guidance counselor tells her about Katie Apostolides, a girl with Down syndrome who graduated with an associate's degree from a Pennsylvania college. Now she comments to her teachers, "Maybe I can graduate from high school and go to college like Katie." The vast expansion of emerging technology over the past few decades has provided teachers with many innovative tools for differentiating instruction for students with special needs. These tools allow students to derive knowledge and engage in activities previously inaccessible to them. Assistive technologies cover a wide range of devices and methodologies, including crutches, wheelchairs, grab bars, text telephones, large-print and Braille reading materials, sign language, hearing aids, adaptive keyboards, and augmented and alternative communication devices. By contrast, the concept of "universal design" was originally developed by urban planners and architects and refers to designs that improve access for people with disabilities while also benefitting the general public (Steinfeld & Maisel, 2012). One of the best illustrations of universal design is the curb cut on a city street. This simple modification not only helps the blind and those in wheelchairs to cross the street more easily, but also benefits joggers, teenagers on skateboards, and parents pushing strollers. Affective networks in the limbic or subcortical areas of the brain (the "why" of learning). Strategies for stimulating and motivating students' interest in learning (affective networks) (CAST Inc., 1999–2012). The focus of UDL is not strictly on individual students with disabilities (as is the case with assistive technologies), but rather on designing an educational environment that can accommodate a wide range of learning differences. Essentially, assistive technology and UDL represent two approaches that exist along a continuum. As Rose, Hasselbring, Stahl, and Zabala (2005) note, "[a]t the ends of this continuum the two approaches are easily distinguishable. Toward the middle of the continuum, such easy distinctions are muddied, and there are greater points of interaction and commonality" (p. 508). Example of poor niche construction (without assistive technology): Sixteen-year-old Samantha has significant intellectual disabilities and gets frustrated when she can't express her needs for food, water, toileting, and other basic necessities. She can easily spiral into tantrums or meltdowns, which often result in some of her favorite activities, such as finger painting and playing with dolls, being taken away from her as part of a behavior modification program. Lately, she has become withdrawn and morose, and an appointment with a psychiatrist has been scheduled. Example of positive niche construction (with assistive technology): Twelve-year-old Irvin has autism and often has difficulty communicating with others. His teacher has purchased the iPad app Proloquo2Go, which Irvin uses to make his needs known. For example, if he's hungry, he simply touches the appropriate button on the screen and a synthesized voice says, "I'm hungry." Irvin has discovered that he can now more easily express his ideas and feelings and has become more communicative. Example of poor niche construction (without UDL): Ten-year-old Jason has learning disabilities and struggles with writing. He has begun to misbehave during writing assignments. He is increasingly spending writing period in the time-out area and often has to stay in for recess to make up work. Example of positive niche construction (with UDL): Eight-year-old Nathan has learning disabilities and struggles with reading and writing assignments. His teacher has started using speech-to-text software with him, which allows him to complete his writing assignments by speaking into a computer. His interest in writing has increased dramatically, and many of his typically developing peers have started using the software themselves to improve their fluency and increase their writing productivity. Fostering new relationships that will enhance the student's life. Example of poor niche construction: Nate is a 1st grader with ADHD. He has been having problems getting along with his regular classroom teacher, who wants him placed in a special day class. His peers have been giving him a hard time about this during recess. He has increasingly been involved in fights with classmates and seems to have no close friends. A psychologist described Nate as combative, uncooperative, and angry. Example of positive niche construction: Jose is a 1st grader with ADHD who has been having problems with his regular classroom teacher. A series of meetings are held after school to help resolve much of the conflict between them, resulting in a better relationship. In addition, a 5th grade student has become a "buddy" to Jose and plays ball with him every day at recess. Jose has started to form tentative friendships with his peers. Students are placed in special education programs because, for one reason or another, conventional approaches to teaching and learning have failed to help them. These students require innovative approaches to learning that have not yet been tried with them and that build upon their particular strengths, interests, and abilities. So, for example, teaching reading fluency through song lyrics for a child with Down syndrome who loves singing and music may be an effective learning strategy for that particular student. Although many of the strategies in this book are research-based, it's important to remember that we need to use differentiated learning strategies that reflect the unique strengths of each student, not just strategies that appear on an approved list of "evidence-based" interventions. The idiosyncrasies, nuances, and complexities of the teaching process all point to the fact that a teacher's own experiences, beliefs, and values may frequently be more decisive for a child's learning progress than research findings (see, for example, Biesta, 2007; Clegg, 2005). Example of poor niche construction: Sal is a 3rd grader with learning disabilities who struggles with his reading. He is taken out of regular reading class and spends an hour a day in a resource room working on a phonemic awareness program that he says is "boring." His regular classroom teacher is concerned that his time in the resource room is making him fall further behind his classmates in the regular classroom. Example of positive niche construction: Ivan is a 3rd grader with learning disabilities who struggles with reading. He has a vivid imagination, loves drawing, and prefers working with pictures rather than words. Both his regular classroom teacher and his special education teacher have been using highly illustrated books (including pop-up books), letting him draw pictures of vocabulary words, teaching him to visualize what he's read, and giving him time each day to work with a highly graphic software program that assists him with his phonemic awareness skills. Children's hopes and dreams for the future often serve as stepping-stones to a stronger sense of purpose and direction in life. For many neurodiverse students, however, dreams of the future may be obscured by a sense of futility, limited expectations, and learned helplessness. In such cases, it is important for teachers to nurture the students' aspirations. At the middle and high school levels, it may be especially important for teachers to suggest future careers that students might be well suited for, given their unique constellation of abilities. So, for example, students with learning disabilities who possess high visual-spatial abilities might be encouraged to consider a future in art, graphic design, architecture, filmmaking, or engineering. Students with ADHD could be asked to think about careers that involve novelty, movement, or change, such as firefighting, newspaper reporting, surveying, or fitness instruction. High-functioning students on the autistic spectrum may be encouraged to consider vocations that involve systems, such as mathematics, computer programming, science, mechanical repair, or accounting. A student with intellectual disabilities might be encouraged to aspire to postsecondary education or perhaps to a future as a childcare worker, a veterinary assistant, or a hospital attendant. In each of these cases, encouraging students to aspire to careers that suit their strengths can provide them with a sense of meaning and purpose in life. Example of poor niche construction: Ricardo is a 12th grade student with high-functioning autism. He excels at computer programming but doesn't believe anyone will want to hire him with his disability. He has no plans for what he'll do after graduating from high school. Example of positive niche construction: Lucille is an 11th grade student with high-functioning autism. She excels at computer programming and is told about a software firm in Denmark that hires 75 percent of its workers from the autistic spectrum because of their gifts for finding "bugs" in software. This information excites Lucille, who starts to investigate postsecondary programs that train people to become computer programmers. A key principle of the Individuals with Disabilities Education Improvement Act (2004) is that students in special education should be placed in the "least restrictive environment." This usually means that students need to be educated as much as possible alongside their nondisabled peers in a regular classroom. But the word environment has a range of other possible interpretations that may be equally important for meeting the needs of students in special education. For example, research suggests that children labeled ADHD perform particularly well in "green" (i.e., natural) environments (Kuo & Taylor, 2004). For such students, the outdoors may prove to be the "least restrictive environment." Similarly, students on the autistic spectrum who have hypersensitivity to sounds may perform better in an environment where school bells are muffled and chairs are padded to avoid squeaking. Those with emotional or behavioral issues may benefit from having a space to go to in the school where they can "chill out" after a meltdown. Finding or creating environments where students' cognitive, emotional, social, or physical strengths have the best chance of being reinforced is what matters most here. This means viewing the whole school and even the surrounding community as a complex network of possible microhabitats for meeting the varied needs of students with special needs. Example of poor niche construction: Julie is a high school junior with an emotional disorder and learning disabilities. She struggles with coursework and is bored in both her regular and special education classrooms. Her teacher thinks she may also have ADHD because of her difficulty concentrating in class. Julie has been referred to the special education teacher for more testing. Example of positive niche construction: Jason is a high school senior with an emotional disorder and learning disabilities. He struggles with coursework and is bored in class. He really enjoys working with his hands and especially loves building furniture in his spare time. His school counselor learns of this and arranges for Jason to spend his afternoons involved in an apprenticeship program in furnituremaking at a local community college. The establishment of appropriate assessments for students with special needs based on Common Core Standards must represent a flexible process where the students' own abilities and challenges are taken into consideration. Guidelines issued by the authors of the Common Core State Standards Initiative indicate that for students with disabilities to achieve at high levels on these national standards, appropriate accommodations need to be put into place. According to the authors, these accommodations should include: changes in materials or procedures, an Individualized Educational Program (IEP), specialized instructional support personnel, assistive technologies, and instructional supports for learning (including Universal Design for Learning). The authors indicate that UDL in particular encompasses a range of strategies "which foster student engagement by presenting information in multiple ways and allowing for diverse avenues of action and expression" (Common Core State Standards Initiative, 2011). Thus, the Common Core Standards Initiative aligns directly with four components of positive niche construction described in this book: assistive technologies and Universal Design for Learning, enhanced human resources, strength-based learning strategies, and environmental modifications. In addition, the other three components of positive niche construction—strengths awareness, positive role models, and affirmative career aspirations—can be characterized as additional supports for students with special needs in meeting the requirements of the Common Core Standards. The Center for Applied Special Technology (CAST) has observed that some Common Core Standards may present substantial obstacles to students with disabilities. Take the following example: 1.MD.3—Tell and write time in hours and half-hours using analog and digital clocks. CAST suggests that this standard (and others like it) may prove to be an insurmountable barrier for students who have difficulty writing. They suggest that the word express be substituted for write so that students with disabilities have other ways of reaching the objective. Alternatively, they suggest that the word write be interpreted broadly to include other means of expression (Center for Applied Special Technology, 2012). This flexible approach to assessment based on strengths should be followed throughout the Common Core Standards. In this way, students with special needs can be challenged to reach high levels of performance using their unique patterns of learning and behaving. The concept of neurodiversity suggests that we shift paradigms from one based on deficits and "remediation" (literally, the reconnecting of what has been damaged) to one based on the cultivation of strengths. Just as animals in the wild work methodically to build an environment that best suits them, educators should work diligently to construct a positive niche that fits the unique needs of each individual child with special needs. We will explore the use of positive niche construction for several disability categories in the following chapters. Examine the quality of the discourse among teachers at your school regarding students with special needs. Do the statements that teachers make about students reflect more of a deficit orientation (e.g., "You know, he's really low in math and has terrible reading comprehension skills") or more of a strengths-orientation (e.g., "He's got this great attitude and yesterday drew the most amazing doodle on his math worksheet")? See if you can count, over the course of a day, the number of positive and negative statements that you hear about students with special needs at your school. What does this experience teach you about your or your teachers' implicit attitudes about these students? Read some of the literature in the emerging field of neurodiversity. Possibilities include Thomas Armstrong's The Power of Neurodiversity, Sarah Hendrickx's The Adolescent and Adult Neuro-diversity Handbook, Susanne Antonetta's A Mind Apart, and the Disability Studies Quarterly special issue, "Autism and the Concept of Neurodiversity." Alternatively, read one or more books by neurologist and essayist Oliver Sacks. My personal favorites are An Anthropologist on Mars and The Man Who Mistook His Wife for a Hat. How does your reading help to shape your feelings and thoughts about the need to see students with special needs in a new and more positive way? Reflect on how Response to Intervention (RtI) and Positive Behavioral Interventions and Support (PBIS) align with the concepts of neurodiversity and positive niche construction as described in this chapter. Write about or discuss with colleagues how these concepts might be integrated within an RtI or PBIS framework. Use the seven components of positive niche construction discussed in this chapter to evaluate the experiences of one or more students with disabilities at your school. Would you characterize these students as being in positive or poor niches? If the students are in poor niches, describe the practical steps that need to be taken to construct more positive niches for them. Select one of the components of positive niche construction discussed in this chapter and find out more about it through reading, classroom observations, or action research. Plan a project, paper, or presentation focusing on the potentially positive impact of this component on one or more of the students with special needs in your school. What are the implications of neurodiversity for how we structure special education in the United States? How might special education be different if politicians, administrators, and teachers took neurodiversity more seriously? Write a position paper or conduct a discussion group that focuses on these questions. Copyright © 2012 by Thomas Armstrong. All rights reserved. No part of this publication—including the drawings, graphs, illustrations, or chapters, except for brief quotations in critical reviews or articles—may be reproduced or transmitted in any form or by any means, electronic or mechanical, including photocopy, recording, or any information storage and retrieval system, without permission from ASCD.